US President Barack Obama has asked Republican and Democratic Congressional leaders to come to a meeting at the White House. The 18 November meeting will include House Speaker-elect John Boehner, Senate Republican leader Mitch McConnell, House speaker Nancy Pelosi and Senate Majority Leader Harry Reid. The new members of Congress are sworn in in January, with the time before that known as a "lame duck" session. 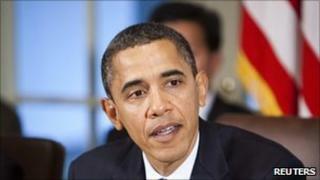 Mr Obama wants various issues tackled. Economic measures, tax cuts, unemployment benefits and a nuclear weapons treaty could all be on the agenda. The mid-term elections resulted in heavy losses for the Democrats. The president's party lost control of the House of Representatives and now has a reduced majority in the Senate. "I want us to talk substantively about how we can move the American people's agenda forward," Mr Obama said of the planned meeting. "It's not just going to be a photo op." White House spokesman Robert Gibbs suggested the meeting would not be a one-off. Talking about the format, Mr Gibbs said staff would not be present and there would be a working and social dinner. "What's going to be critically important over the coming months is going to be creating a better working relationship between this White House and the congressional leadership that's coming in," Mr Obama told reporters. "It's clear that the voters sent a message, which is that they want us to focus on the economy and jobs."